There will be records. There will be pizza. There will be beer. There will be records. There will be t-shirts. There will be cassette tapes. There will be a bunch of record labels from across the state of Texas. There will be ATH Records. 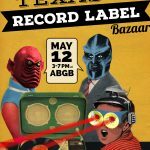 So, tomorrow, from 3-7, your job for the early evening is to set out to the ABGB, swing by the Texas Record Label Bazaar. You know how you always tell your friends how much you love live music, and how much you support it by going to shows? Well, you can also support the labels that hopefully serve as another cog in the Austin/Texas music machine. Thanks to Modern Outsider, ABGB, Texas Music Office and KUTX for the organization and support! For a list of the labels present, check the EVENT PAGE.